The official Japanese YouTube channel revealed a new card as part of its weekly roundup, a Spike Brothers Common from V-Extra Booster 01: The Destructive Roar, Satanic Middle Guard. Although the card's Japanese name is Satanic Middle Guard (サタニック・ミドルガード Satanikku Midorugaado) the official English subtitles censor the name to "Diabolic" Middle Guard. Similar cover-ups were done in the past with Genocide Jack and Aurageyser Damned. 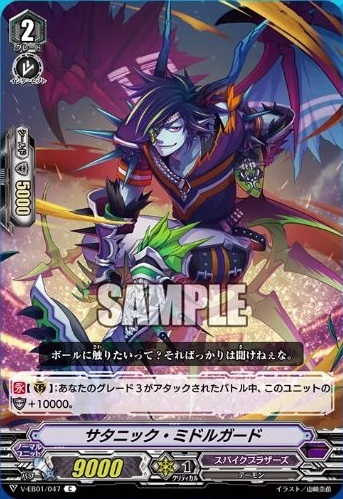 Satanic Middle Guard's Continuous skill turns it into a guardian on par with a Critical Trigger, but because this only works when defending grade 3s it's effectively gated behind your third turn ride. Note that if multiple units are battled "in one attack"--for example, by a future Dragonic Kaiser Vermillion--Satanic's Continuous ability will still only work if you call it to guard a grade 3, because the opponent's vanguard is engaged in two or more battles at once and you have to call Middle Guard during the battle a grade 3 is attacked for its Continuous ability to become active. Calling it to guard a grade 2, even when your grade 3 is also being attacked in another battle, wouldn't resolve it. The skill makes it easier to defend grade 3 rearguards like Juggernaut Maximum and Sigiswald. 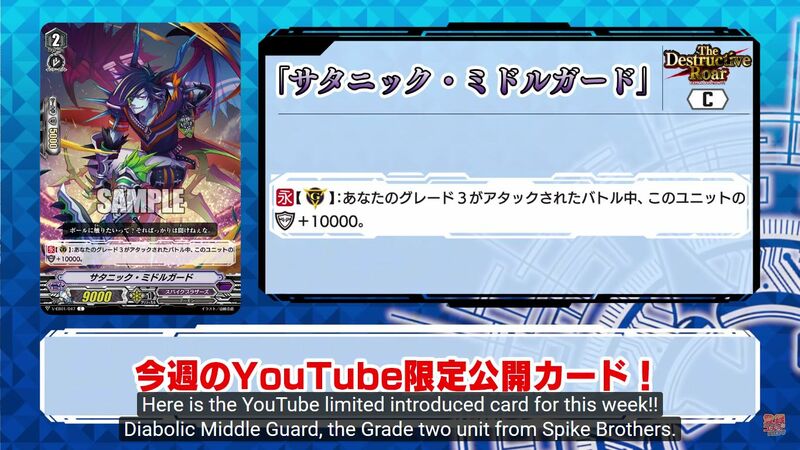 With Silent Tom and Phantom Black's guard restrictions both blocking normal units, these types of shield-gain skills are less useful for defending the vanguard, though they can still come in hand versus Sentinel-blockers like Dragonic Waterfall. The issue for Satanic is similar to the problem faced by Shooting Bobby. Offensive cards like Brakki have priority in general, as additional shield can be useful in specific defensive scenarios but doesn't directly contribute to your overall win condition. The last time the channel had a YouTube exclusive was Burstraizer.